Catch up on previous episodes of Fear the Walking Dead! 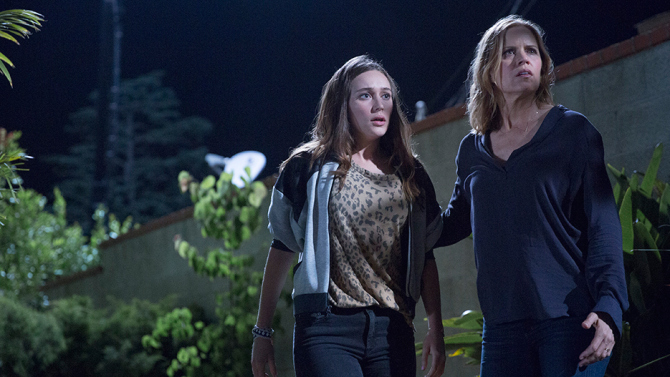 If you haven’t seen the third episode of Fear the Walking Dead, read on at your own risk. There will be spoilers ahead! There were several unbelievable moments in this episode, but this was one probably the dumbest. I had a real hard time believing that Madison—a woman who had just witnessed a couple of actual zombies, a woman who is now scared to death that she’s lost her husband, a woman who is trying to help her son successfully detox in the midst of the literal apocalypse—would be up for playing a jolly game of Monopoly. I get the need to distract yourself from the horrors outside, but since the viewers are the only ones who know what’s up and Maddie and her kids really need to process and figure out what’s happening around them, it felt like a really derailing moment in the episode, especially given the fact that, across town, Travis and the gang are literally fighting for their lives amongst the hordes of rioters and walkers. Travis and Team Barbershop are still in the shop, listening to the horrific sounds of rioting outside. Complete and utter destruction and mayhem are happening outside, making staying put the best option in Travis’ mind. He keeps reminding everyone that the police will arrive soon and regain peace in the area, even though hours have passed with no end in sight for the riots. Despite Travis’ desire to wait and “let the authorities handle it”, the group is forced out of the shop when a break-in and fire next door make staying put unsafe. Interestingly enough, when we finally get a closer look at the riots, we see that there aren’t as many walkers as all that noise and violence would make you believe; it’s mostly regular, living humans. I felt like this was supposed to be an impactful social commentary, but I’ll be honest: since the humanity we’ve met on FTWD have been so eye-roll-inducingly stupid and unrealistic, it didn’t sink in for me. Travis and the group are able to run to the car with very little incident—a structure falls on Barber Daniel’s wife (Griselda). She’s hurt and has to be carried to Travis’ truck—which happens to be the only thing not touched by the riots, #LuckyDay—but other than that it’s no big deal. Yes. Yes they are. But more on that in a moment. Madison and her kids decide that now is the time—with their walker neighbor literally right outside their door—to step outside to steal their neighbor’s shotgun. And we thought trying to get Carl to stay in the house was bad, amirite? The rest of the scene is a creepy supply run, ending with Alicia coming face-to-face with the home’s resident, Susan, who is now a walker. Alicia barely is able to escape, just in time for Travis and his group to arrive home and find their walker neighbor chowing down on the German Shepard. #RIPDog. It’s then that we get another eye-roll moment. Despite everything that Travis has seen, he decides to try to talk to his walker-neighbor and reason with him—unsurprisingly, the walker is not in a chatty mood, and instead tries to have a bit of a Travis-flavored snack. Thankfully, Daniel is capable of getting stuff done and saves Travis by shooting the walker in the head. I can see that they’re trying to set Travis up to be a Rick Grimes-like character: good, moral, and not ready to lose his humanity in the face of the end of the world. However, I think Travis is missing the common sense and basic survival instinct that Rick has. It doesn’t make Travis a man struggling with humanity and morality in the face of unspeakable odds—it makes Travis a moron and a liability. We see Travis’ liability/moronic tendencies a lot this episode, like when he refuses to let his son learn how to shoot a gun to protect himself from the actual monsters outside, when he puts his trashcan on the curb after a night of walker and puppy gore, and most especially when he stops Madison from putting Walker Susan down. After all, he doesn’t want her to do something that “can’t be undone”. Of course, Madison not killing Susan does something else that can’t be undone; she puts Susan’s husband, Patrick in direct risk when he returns home early from a business trip (putting aside the fact that Patrick returns home seemingly 100% oblivious to what’s happening, despite the fact that all flights being cancelled and, from the look of things, walkers being all over LA). Just when Susan is about to bite Patrick, Susan is shot through the head by a troop of soldiers taking over the neighborhood. Patrick is taken away, Travis and Madison’s families are logged with the military, and the neighborhood is taken under military protection. Travis, ever the apocalypse expert, then makes a comment about how “everything will be okay now”, because that’s totally how these things go in literally any zombie movie ever. What did you think of this week’s episode? Do you feel like the show is getting better, or do you think it’s still struggling to find its feet? Let me know your thoughts in the comments!